If a valid PAN is changed more than once, it is rejected at the TIN. In all the above scenarios the FVU file will be created successfully but the same will be rejected at the TIN central system. Fast Facts has incorporated the above changes in its #1 eTDS Correction utility and version 2.95 can be downloaded for the same. With above changes, the probability of eTDS correction statements getting rejected at TIN will be further minimized. TIN web site provides for registration of TAN by deductor , which is necessary , among other things, for downloading consolidated fvu file, Form 16A text file. Board resolution certifying the authorized person list, which includes the name of the authorized person. After receipt of above documents, the TRN will be emailed to the deductor. 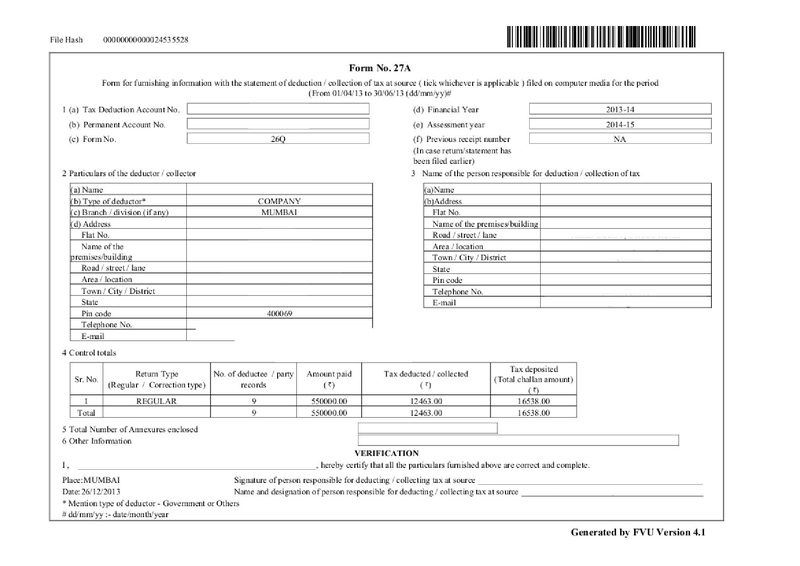 Deposit of TDS can be made either electronically or by a physical challan. e-Payment of tax is mandatory for companies and others covered under mandatory tax audit. Several times, while depositing tax, errors may creep in. To rectify these errors, income-tax department has issued new guidelines effective 01-09-2011. This new mechanism allows Banks to correct physical challans only.For correction in electronic challan, request will have to be made to Assessing Officer. What is the time frame for correction request ? For Major head, minor head and nature of payment, request can be made within 3 months of deposit of challan. What is the remedy available after time frame is over ? After lapse of time frame, request can be made to the Assessing Officer. What is the time frame given to bank to carry out correction? What are other conditions for correction ? matches with the name as per the new PAN/TAN. amount so corrected is not different from the amount actually received by the bank and credited to Govt. Account. correction request is made only for amount, a 2nd correction request will be allowed for correction in other fields. What is the procedure for requesting correction ? The tax-payer has to submit the request form for correction (in duplicate) to the concerned bank branch. The tax-payer has to attach copy of original challan counterfoil. In case of correction desired for challans in Form 280, 282, 283, the copy of PAN card is required to be attached. In case of correction desired for payments made by a tax-payer (other than an individual), the original authorization with seal of the non-individual taxpayer is required to be attached with the request form. What is form of application to bank ?